This avant-garde movement founded by Theo van Doesburg in the Netherlands was essentially a painting and sculpture movement, even when it had some architectonical examples too. The basic aim of the movement was to try to produce pure form and colour, completely de void of realism and the artist’s emotion. Neo-plastic style is characterized by a reversion to the basic fundamentals of art: colour, form, level, and line. Artists used mostly straight horizontal and vertical lines and black, white, grey and primary colours. The Neo-Plasticism ended in 1919 when van Doesburg founded a new alliance called `Abstraction-Creation´. The Neo-Plasticism was very influential in the development of the Bauhaus and the International Style. 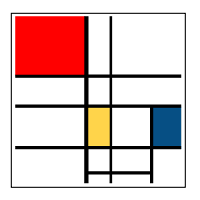 The most famous artist of the movement was Piet Mondrian. · Coloration must be in the primary colours of red, blue and yellow or the no colours of black, grey and white. · Balance and rhythm are enhanced by relationships of proportion and location. Mondrian began his career as a figurative painter but in 1911 he met the Cubists in Paris and changed his mind about the construction of the work of art. After that he developed his poetry of the primary values or structural of the vision: line, plan, colour. He travelled to London and to New York where his style was marked by the fraction and the visual animation in the plan of his pictorial space. 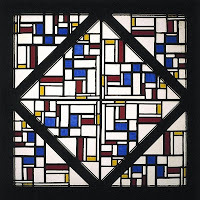 In Mondrian’s opinion Cubism is rational but not enough because it did not reach to the last consequences. He thought that nothing can be known without feeling it but to know the real essence of things it is needed to make a deep thinking in which the mind works alone. Given that the human mind is equal for every person, the mental process should begin in some common notions, this is, on the elements of the line, the plane and the basic colours. All his paintings between 1920 and 1940 are similar: a net of coordinates that forms squares of different dimension and contains the basic colour with a dominance of the white (light) and the almost present black (lack of light). Each of them depends on a different perceptive sensation (and consequently sensitive and emotive). Any experience of reality, does matter how different it will be, must lead to reveal the constant structure of the consciousness. His painting can be included in a perfect urbanism: the city aims at having a living space for a society whose acts should be rational, ethical and aesthetic. His work had a great influence on architecture, not only in the architectonical shapes but in the value of vital functionality of the spaces, the plans and anything that defines and distributes it, and the project in itself. This is why although his painting may appear to be cold Mondrian was, after Cezanne, the highest, most conscious and most civical conscience of modern art.